Browse: Home / autoresponder – Quick python script to automatically load NTLM hashes from Responder logs and fires up Hashcat to crack them. The aim of this python script is to run in addition with Responder while doing internal assessments. 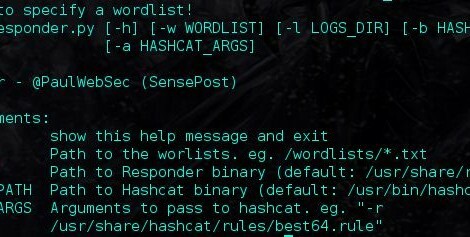 This script will monitor the logs from Responder, loads NTLMv1 and NTLMv2 on the fly and crack them with your instance of Hashcat. Locally. print "[!] You need to specify a wordlist!" ← al-khaser is a PoC malware with good intentions that aimes to stress your anti-malware system.